The Top Flite balancer is an innovative way to balance your aircraft or boat propellers, spinner backplates, car wheels and tires, as well as many other items in the hobby industry. Precision ground balancing shaft, held between two powerful "Ceramic 8" magnets allows shaft to "float" for maximum sensitivity Inexpensive and easy to use...essential for every modeler. 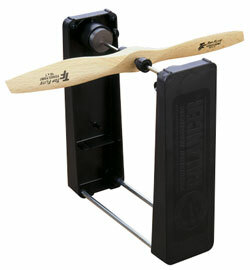 Reduces prop vibration-reducing engine wear and prevents structural damage Can be used anywhere-on the workbench or at the field Constructed of long-lasting, high impact plastic and nickel steel Includes instructions explaining how to correct out-of-balance props, and even how to use the balancer to determine wind speed. Can also be used to balance boat props, car wheels and tires, ducted fans, spinners, nose weights and more! Balances up to 24" propellers and any size wheels and tires.